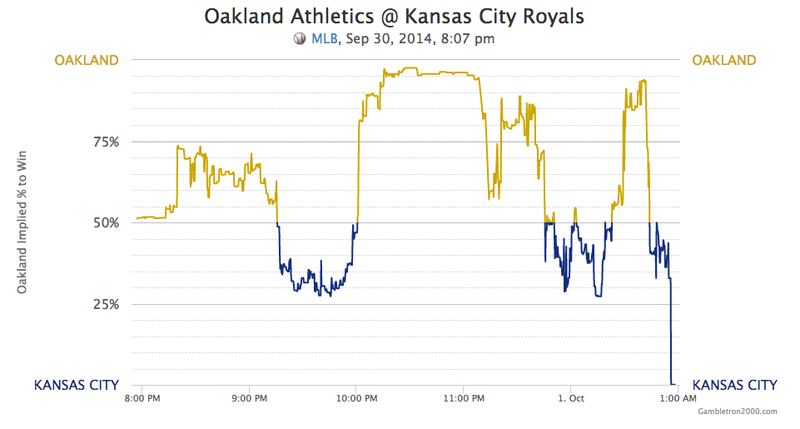 Last night's AL play-in game was the kind of protracted back-and-forth that makes a baseball game genuinely exciting. It also drives bettors nuts. Here are the implied winning percentages, which are modeled off of live betting on Betfair by Gambletron 2000. Can Real-Time Gambling Odds Tell Us Which Games Are Most Exciting? Gambletron also gauges excitement, but here we'll take issue with its rankings a little. Its 2164 "hotness" rating for last night ranks behind some other recent games, like Brewers at Pirates on Sept. 19 or Tigers at Twins on the 16th. But the sort of late-inning serve-and-return, never straying too far from even, until it did, and then came back the other way, is pretty rare, and a lot more entertaining than just a big comeback in single-inning.